Most of you may have heard about the Air Car that has been in much news over last year, thanks to the Tata backing the project. If you read the comments on my earlier post on air car, you would find many people have reservations about the success of the project. However, unlike years of research and experimentation (and Offcourse millions of funds) spent on air car, a group of young Indian college students have done a stupendous feet. They have created a vehicle that runs on water ! yes…water ! Now the car literally does not run on water, but hydrogen from the water forms the major component for running the car. This Hybrid vehicle runs nearly 500 kilometers on a single litre of fuel (petrol) with water as an important component. 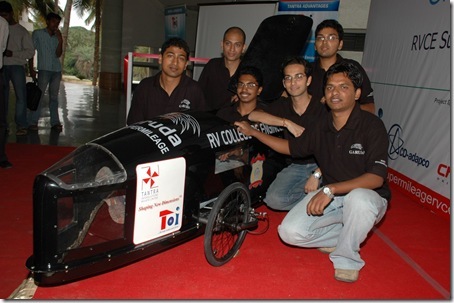 That’s the prototype of `Project Garuda RVCE Super mileage’ by students of R V College of Engineering in their bid to build most energy-efficient, eco-friendly vehicle. The corporates have jumped over this idea and many of them have expressed keen interest with with GE stepping in to financially support initial research costs and provide them with light and state-of-the-art polymers for the car’s aerodynamic shell. The team also has a blog, if you wish to follow them. The year that was 2008 ! what happends to the seperated oxygen ? Even its possible to drive any spark ignition engine with only water i mean HHO. No need for Petrol, Diesel and Gas. This was revolution from 1930s but Oil companies doesnt like such an innovation as their profit will reduce. One inventor was killed by poisoning, another inventor was shot dead! So dear Indian inventors be carefull! Our oil companies may also threat you to stop such inventions or even oil selling countries may buy you to stop your process. Please also have a look in to Stanley Meyer’s website. Also check videos in UTube as water fuel cell by Mr.Stanley meyer and this was repeated by Mr.Ravi Raju from India who has also posted videos of his results in Hydrogen generation. Today morning i read in the Deccan herald newspaper, A group from R.V.College of engineering have developed a kit for autorickshaw which uses Water along with LPG to run the engine. Its fuel efficient and the emissions are drastically less. The mileage for a normal auto is around 20-23km/Litre, but with their kit, the autorickshaw can run upto 30 -33km/litre. I can see bangalore to be a less polluted city in the days to come. Great work R.V students. You guys rock. Maybe Genepax from Osaka, Japan were the first on this one. They demonstrated a water driven car some time last year.